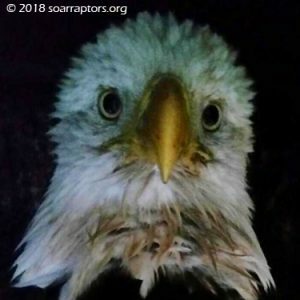 This adult female bald eagle is our first lead toxicity case of the 2018-19 hunting season. Her blood lead level is in the sub-clinical range and this eagle is being monitored for nervous system issues that may appear. Elevated lead levels always have Kay concerned about vision and eye function. Kay says she can definitely see to bite! She is receiving supportive care. She is a tish thin at 9 pounds. Why was she admitted… she was found by Eric with Wright County Conservation. Thanks to Ron H for transporting her to SOAR! Eric said the location is where many white-tailed deer are hit on the roadway and near the Lake Cornelia State Game Management Area. This eagle does have a non-compound fracture to her radius and ulna (non-compound meaning did not break the skin), so we suspect she was hit by a vehicle. The bones are aligned well, but the bone healing is the most worrisome. X-ray confirmed that the bones did not form a union. This eagle was humanely euthanized.